Tuck into rib-sticking renditions of the Korean staple, bibimbap: a layered dish of rice, spiced vegetables and meat topped with a fried egg. Bright colours, Ikea-style furniture and walls plastered with Polaroid snaps of happy diners mark Bi Bim Bap as a youngsters’ hangout. It’s more suited to an after-work pit stop than a lingering meal; service is quick and the food filling. There are Korean beers and spirits to try as well. As the name suggests, Bi Bim Bap’s big draw is the stone-bowl rice dish of the same name – served in ten varieties. Classics include beef, chilli chicken, spicy pork or seafood, but veggies are well catered for too with tofu, mushroom, or brown rice, ginseng and gingko versions on offer. Some say the key to a good bibimbap is how well it’s mixed together, and staff let you do the honours here (as well as adding your own koch’ujang and doenjang sauces). In our experience, the results have always been sound, with crisp rice at the bottom and a decent amount of toppings to blend through. Other dishes, including fried noodles, jeon pancakes and salads, can be more of a mixed bag. The wrappers on our vegetable dumplings seemed more air-dried than crisp-fried, though the chilli-speckled dipping sauce had plenty of flavour. Just a little bit off the beaten track in Soho. Was perfect for us as we had the theatre booked and knew we could be in and out of this place in an hour. At 1830 theres no queues and we got seated straight away. We ordered the Korean Fried Chicken which I think is expensive as it works out about £1 per bit of chicken. Granted it was tasty! I ordered the Veggie Bibimbap and it was tasty and rainbow coloured. Really tasty and healthy. This place is great for a quick bite to eat, if you go for anything a little bit of piste it starts to get expensive but overall its a good place for wholesome food. Cheap & cheerful rings seriously true for this Soho mainstay. It's not exactly a sight for sore eyes and you may have to put up with being seated on a sellotaped bar stool in front of the screechy, nattering wait staff but it's sometimes exactly what you're looking for and has served a cheap and filling purpose for me on multiple occasions now. A date when you're teetering at the end of the month, a quick and warming fix before late night drinking plans or the theatre - it's always there doing it's sizzling bowl of rice and deliciousness thing. I'd always recommend paying the extra for a raw egg on top and go heavy-handed with the squeezy sauce on the table. This was our second time at Bi Bim Bap and from our first trip, I remember being wow'ed (hence why the second trip). This time however, the food was a bit too oily for our liking and the flavours just didn't pack enough punch as we remember. We shall return before we write it off completely because when it was good, it was epic! Bi Bim Bap is the place to go when you want some quick bite on a slightly cold autumn day. As most of the Bi Bim Bap dish served in a hot stone bowl, guaranteed that your food would be hot from the first to the last mouth full. Meat lovers can go for the traditional "Bulgogi" bi bim bap, featuring flavourful Korean marinated slices of beef with colourful and crunchy vegetables. Mixing it with the spicy hot sauce (red bottle) and miso sauce (yellow bottle) provided on the table adding a little bit of fun and the DIY element when dining here. There is also a good selection of vegan and vegetarian options. I love the mushroom bi bim bap when I do not feel like eating meat. I am also pretty sure they serve frozen, not freshly made dumplings: they were soggy and falling apart the way incorrectly defrosted foods are. My mixed seafood bibimbap was a major mistake in retrospective. It was mostly octopus and squid (both extremely sleazy and slippery) with two tiny bits of shrimp. The seafood is advertised as ‘marinated’, but they must be marinating it in their good intentions, as I could not detect a trace of anything remotely resembling marinade. And in general the whole mix - the seafood, the rice, the veggies - was lacking in flavour and did not taste authentic at all. I don't pretend to be a connoisseur, but I’ve been to South Korea and multiple Korean restaurants in the US and Europe. I’ve also ordered a raw egg to mix in with the rice and seafood, which was so tiny it must be sold with ‘XSS’ marking in supermarkets. And let me repeat in case it didn’t sink in - the seafood was appallingly sleazy. I left all of it untouched. The one star I’m giving this place is for the service, which was prompt and friendly enough. But I will not return and will not recommend. The Time Out Review describes bibimbap as "a layered dish of rice, spiced vegetables and meat"
Service was perfunctory (actually that's not quite fair, the waiter who took my order could barely be bothered to speak, didn't even ask me if I wanted any of the options)and said what little he did say with his back to me) The person who cleared up and took payment was charming. Really don't understand the buzz around this place. Annoyingly BiBimaBap doesn’t open until 6pm every evening so I have often had to bypass here when trying to sneak in for some dinner before meeting friends for drinks however when you do get in, it is an extremely tasty and cheap dinner.I recommend the classic bibimbap hot stone bowl dish with the marinated beef.There are just so many flavours in the one bowl and the fun of cooking your dish while eating it is an added element of fun.You can also sample some Asian beers and a few excellent side dishes but the bowl itself is enough for a full meal.Great prices and even better food. One of the main aspects I adore about Korean cuisine is cooking your food literally at your table. Bibimbap covers this perfectly, serving their mixed rice dishes in hot stone bowls, where you can cook your meat/ seafood/ eggs/ vegetables from your seat and it really is novel. I tried the fillet beef and mixed seafood bibimbaps and they were delicious, sadly I forgot to add an extra raw egg, but their homemade red pepper pastes and miso sauces were well received additions. This place is unpretentious, serves Korean Sake by the bottle and fresh food that leaves you comfortably full! I will be back for a quick bite in future. I'm a big fan of this restaurant which has another branch on Charlotte street. The decor is simple, if a little faded but the food is healthy and wholesome. I usually go for the bibimbap (it is in the title...) But there are other options available. You can choose from the basic veggie option or add spicy pork, chicken or beef. I usually go for a raw egg on top. Served in a hot stone bowl you stir everything together to cook it. Including service a main comes to under £10 - hard to beat. Tasty, quick, cheap, easy. Nothing fancy but certianly nothing offensive in the food, decor, or service. Definitely one of my fave spots in the area when I'm looking for a cheap, quick meal, and I would certainly recommend it for this. I always pay 80p extra for brown rice, and I like to get the raw egg for £1 extra as well. Delicious! 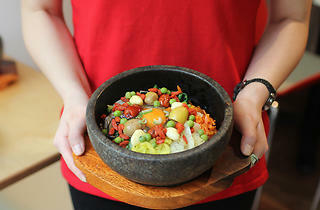 Korean food is still riding the popularity wave in London and Bi Bim Bap is making its contribution. I am a big fan of the korean fried chicken and out of the bibimbaps its a toss up between the chilly chicken or the spicy pork. The servings are generous, nutritious and warming ideal for this chilly weather. Since Seoul Café was close down for demolition some time ago, I’ve been on a quest to find similarly cosy, authentic and inexpensive replacement in central London. Bibimbap came by chance. Visiting on a Friday night, the place was absolutely packed. I have to mention it’s not very big and the tables are extremely closely packed together. We were welcomed energetically and that pace dominated the night. The staff was quick and efficient, to the point we couldn’t relax, we felt impatience or even irritation on their side. They were rude just throwing our bill on the table without us even asking for it. They offer traditional bibimbap, along with typical sides like kimchi, but also noodles, Korean spirits and one beer. My mushroom bibimbap with brown rice and raw egg was tasty, rather sweet. It was totally mild, my two spicy sauces offered to the table helped with add a bit of kick. When I asked what sort of ‘root’ tea it was in the menu, I just got short ‘black tea’. Surprised, I asked again. ‘It’s Korean, it’s similar’ was the whole explanation I got. It was obviously nothing like black tea and a little bit of effort on the waitress site wouldn’t hurt, but I guess she wanted to get rid of us as soon as possible to squeeze the maximum possible number of guests in the night. It’s a good place for a quick meal en route night out in Soho, but definitely not a place for a pleasant meal. My friend took me here - and although it's quite a fun idea, the reality didn't quite live up to my expectation. I'd never had a Bi Bim Bap so decided to go for the familiar sounding Chicken Teriyaki, and was guided my by waitress to go for a fried egg instead of the raw option, which traditionally accompanies the dish. I also opted for the brown rice (additional 70p) instead of the standard white it came with. The food itself was pretty satisfactory, but not as appetising as it had sounded on paper, and the veg was pretty limited. A very popular place, there were no tables free at any point during our meal - and very affordable - my meal costing under a tenner (£7.50 prior to additions). Not a bad place, but satisfactory overall. A pretty disappointing bibimbap. Although it was cheap, there wasn't very much to the dish. It's no wonder they were able to price it so low. There is not much rice in the dish and the variety of ingredients was pretty average. The only redeeming factor was that the service was decent and the food arrived pretty fast after my friend and I placed our orders. Appalling and rude service. Was there one evening and while waiting for a few friend (there was no queue), I asked if I can be seated first as my friends were on their way (about 5 mins away). First staff said ok, but after I just seated for 30 seconds, another staff came - said I can't be seated there and chased me out. Very rude and treated me like a criminal even though it was their staff who seated me in the first place. And not a single word of apology. No matter how good the food is, you can never treat a customer like this, especially being in a food service industry. Will be avoiding this place and telling all my friends and families to do the same. A great place to stumble into in Soho. Its fast, it's loud and it's busy; exactly what you'd expect. The food is well priced and filling, served in a stone bowl that all first timers are just dying to touch. There's a pretty varied menu and it has a funky, modern city kind of vibe. It's pretty straightforward and does what it does well. A nice little slice of Korean in the heart of London. The food is fresh and colourful. I could've done with more of a selection from a Vegetarian point of view. Korean Vegetarian food can be just as varied and exciting as meat food but found a lot of the dishes were either focused on mushrooms or broth. Great for cheap meal out with friends thoughts. Cheap, fast, and value for money is the name of the game here at Bibimbap and having visited myself, this is definitely on my list of places to grab a quick bite. Spread over two floors with a basement seating area, Bibimbap is a Korean restaurant dedicated to one of Korea’s famous bibimbap. The menu is pretty simple and naturally Bibimpap takes centre stage with various cuts of meat to choose from and traditional Korean side dishes to accompany. There’s is a further option of customising your bibimbap even further with extra like raw eggs. I'm no foodie but I thought was very good. It’s plentiful, it’s flavourful and comes sizzling hot (don't touch that stone bowl!). You're given a bottle of soybean paste & gochujang chilli paste to customise your food even further. It’s definitely no Ritz and the decor won’t be to everyone’s taste with it’s almost Hello Kitty like feel. But then Bibimbap isn’t trying to be. Rather, the focus is on the food and I’m more than happy for it to do so. If you're on a budget, looking for a quick bite to eat, or looking for something different than the standard Wasabi, then this is a good place to try. Tip: Pay by cash. If you want to pay by card, spend more than £10 otherwise there is a 50p extra charge on top of your bill. My friend had been recommended this place however I wasn't so sure on the idea! However I normally choose the restaurants so I went with it! I was really impressed. We didn't book and were seated straight away! Plenty of space upstairs and downstairs. They're delish! Really filling, plenty of flavour and served quickly for a good price! I was a bit "meh" about going here for lunch with my colleagues but I was pleasantly surprised by how good the food was. Masked behind a rather nasty wipe-clean-plastic-menu-with-a-hello-kitty-scary-vibe there is actually quite a good eatery hiding away. Service is pretty appalling (nonchalant, disinterested) but hey ho, it's fast and the food is good. So four stars from me. A pretty nice quick lunch. Not life changing, but fairly tasty and good for the novelty of getting to (kind of) cook the meal yourself. Decor also leaves a little to be desired and its a little rammed, but definitely OK for a drop in drop out type lunch. Definitely falls into the 'good for the price' category, you can get a filling and well-cooked lunch with a drink for around £10. Would have given this place four stars if it wasn't for the fact that I needed to pile on the chili sauce to give my 'spicy' chicken dish the kick I was expecting, but if you're not into spicy food that may well not be a bad thing! Cheap enough. Tasty enough. Useful for a quick lunch or evening budget pit stop, polished off my spicy pork bi bim bap bowl but it won't live long in the memory. Chance also to broaden your beer horizons with a Korean Hite or Cass, disappointingly bland though. This place is not too bad! I like their quick service and straight forward bibimbap. I do think perhaps they can add a bit more meat in there. Well-made and cheap for London! The place is nothing special as far as venue goes and it feels at times a bit fast-foody but the dishes are big, hearty and filling and go below the 8GBP. Spicy pork is one of my favourites although the Beef Bool-Go-gi is also really nice. Make sure you add a raw egg on top and ask for brown rice, it is better! The only downside to the place is that they take quite a few liberties timings wise. Last time, we went there at 9.30 at night and they had already closed despite the sign on the door said they closed at 10! They were already cleaning the floors and yet, they let us get in and enjoy a quick dinner. Having stumbled across Bi bim bap for the first time last week, I had mixed feelings. I was with a vegetarian friend and our food was tasty but not memorable, without the miso dressing placed on every table it would have been pretty bland. I will try again, but definitely think the meat and fish options are Bi bim baps speciality. The toilets were a 5/10! BiBimBap gave me my first taste of Korean food and I've been a fan ever since! It serves up hearty and filling fare for an extremely wallet-friendly price! Whilst the star of the show is the eponymous dish, bibimbap (a Korean dish of rice and vegetable/meat/egg toppings, served in a hot stone bowl in order to cook the egg as it's mixed around), there is much to recommend the other things on the menu if you're feeling flush! The japchae (stir fried sweet potato glass noodles which are addictively umami and moreish) and the paejong (seafood pancake) are also highly recommended! It's the perfect place to go for a quick and cheap meal in the heart of Soho! BiBimbap is one the best hidden gems within Soho and definitely worth a visit if it is your first experience of this Korean staple dish, or if you are a bibimbap connoisseur. I have only ever eaten BiBimbap in this aptly named restaurant, so can’t speak for the other dishes (which there are plenty of), but really, if you are visiting here, you have to opt for their signature dish. 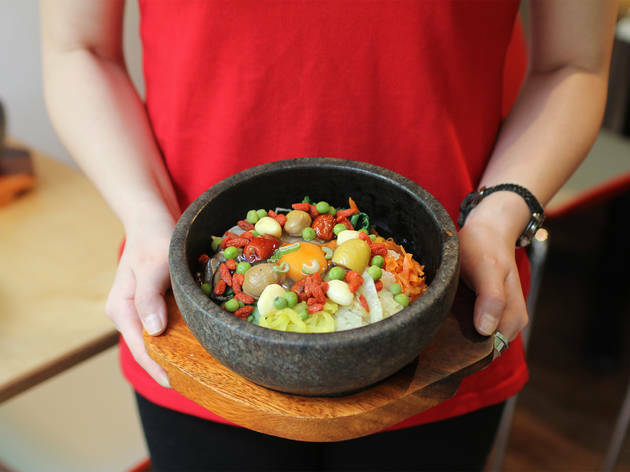 A combination of rice, vegetables and meat, cooked in a hot stone bowl, with the addition of raw egg that cooks while you stir; BiBimbap is hearty and delicious. There are lots of varieties on offer, such as chilli beef, spicy pork and tofu with either white or brown rice. They also provide your with two magic sauces (they do say their names but I can never remember them!) which means you can tailor your own dish to your liking with addition of chilli and saltiness. With yummy sides such as spicy rice cakes ( an odd idea, but essentially just tasty, sticky, chilli stodge- divine) and a selection of Korean beers on offer, BiBimbap is the perfect place for a quick pre theatre or post work dinner. If you are wanting a long catch up with a friend or a romantic dinner, probably opt for an alternative as the service is rapid and efficient in this café style eatery. This is one of my favourite restaurants in London. I love the Dol Sot Bi Bim Bap - a very simple but very tasty rice dish, with cucumbers, spinach, carrots and a few other vegetables, topped with either a fried or a raw egg. The dish cooks in a hot stone bowl, while you stir it, cooking the egg and the vegetables. I can also really recommend the spicy rice cakes as side/starter. They have a weird chewy texture, are served in mildly spicy sauce and are highly addictive! One of the downsides are the long queues, however, you can beat them if you try to be there at 6pm when they open. Service can also be a bit of a hit and miss, sometimes you have to wait really long for you food, while at other times it arrives super quick. Bi Bim Bap is the food of the gods, and here it's cheap, fresh and flavoursome. I initially loved the concept on having my meal served in a hot stone, and the raw egg really does take the dish to another level. However, as I'm one of the slowest eaters in the world (don't want to speak with my mouthful innit) by the time I'd reached the bottom of the bowl, the food had been cooked to a crisp. Although, the service is spot on and leagues above some of the other Korean restaurants I've visited in London, so I'd probably go back just for that. This may not be the classiest looking restaurant in the world but it's possibly my favourite. In fact, it's so good I used to go here twice a week for lunch when I worked closer. Naughty? Maybe but it's so delicious and not horribly unhealthy. If you like spicy food, I would recommend the spicy pork but if you like something more flavourful without the heat, the beef bulgogi is definitely the way to go. Also, embrace the raw egg. The hot stone bowl is so hot it'll cook through really quickly so you don't have to worry about any potential health issues and it's a great binder for the dish which kicks up the texture. I generally go for brown rice too but both bases are more than enjoyable. If you're feeling really hungry, I would highly recommend the kimchi pancake as a starter or something to share. This is a great place to have lunch or a pre-theatre dinner. The staff are always friendly and efficient but I do feel like they are more attentive when you're sat upstairs. I LOVE this place! Have been for lunch and dinner (not on the same day) and both were excellent. The Bulgogi Bibimbap is delicious – always say yes to the fried egg on top, it really brings the dish together. The wall of fame is a great way to while away time spent in the queue at the door (if you get there before 6pm you’ll usually get a table straight away, but if you do have to queue it’s worth the wait!) The staff are great and the food arrives promptly, always fresh and piping hot. I'd recommend trying to get a table upstairs if you can, the atmosphere is much better there than downstairs. Love the hot pots! Quick and easy, great for lunch when you don't have much time to wait. Very good atmosphere and good food and pricing. Food was tasty but not out of this world, I expected more considering the queue and reviews. It's a good place to go if you're looking for fresh food whilst in Soho but don't go out of your way as you'll be disappointed. I love this place. It's delicious and cheap! I've never had a bad meal. I would strongly recommend. Friendly service, tasty food, good value if you want a quick meal while pasing through the area. Will go again. Great food however service was slow, unfriendly and did not justify the 10% service charge which was automatically added to the bill. For wholesome Korean food on the go, Bi Bim Bap is great although for atmosphere and experience head elsewhere. This is a little gem of a restaurant in Soho! They do the best BiBimBap's - and they do takeaway which makes them a perfect workday lunch venue. The food is healthy, delicious and filling which stops you snacking in the afternoon... Its at least a once a month treat for me. YUM! One of my favorite restaurants in London. Great service, great food (all the bibimbap dishes are great and especialy the kimchi pancakes are to die for! ), and a convenient location.